Hardy Hall—a women’s preparatory school whose supporters promised would become a feeder school for the likes of Vassar and Wellesley Colleges—was gone within fifteen years of its construction after falling victim to public scandal. In January of 1890, the Spalding Hotel hosted a reception for Miss Kate Hardy of Eau Claire, Wisconsin. 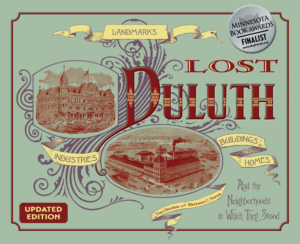 She had been invited to the Zenith City by Duluth businessmen trying to convince her to move her women’s preparatory school to Duluth. Hardy had outgrown Eau Claire and was looking for a larger city to operate her school, which had gained a reputation as the best of its kind in the midwest. Duluth’s elite thought having such an institution in town would save them the trouble of boarding their daughters at schools in the east. Hardy relocated her school to Duluth later that year, renting a residence from Reverend C. C. Salter on Third Street and temporarily using facilities with the new Temple Opera Block for classrooms. But the developers of Hunter’s Park had grander ideas for Miss Hardy. They had set aside four acres of the former MacFarlane Farm at what today is the corner of Woodland and Snively Road. Banker and prominent Duluth pioneer Luther Mendenhall would oversee the building’s planning and finance its construction. Mendenhall, who had come to Duluth from Philadelphia in 1869 to build Jay Cooke’s Lake Superior and Mississippi Railroad, was president of the Duluth National Bank. Mendenhall hired the firm of Traphagen & Fitzpatrick to design the school, and Francis Fitzpatrick took on the role of lead architect. Respected Duluthians Judge Carey and Judge Stearns joined Fitzpatrick and hardy to survey the site, along with Mr. MacFarlane himself. Miss Hardy, in Duluth less than a year, had endeared herself to Duluth’s social and financial elite, who were building her a $50,000 school. Fitzpatrick designed a four-story, Shingle-style building with dark red shingles covering the upper stories and an olive-colored roof. The school had steeply sloping roofs, many dormers, a Palladian window in the front gable, and a balcony. The entire first floor was encased in field stone with stone pillars supporting the front porch. Inside it held dormitories and 12 classrooms, including a kindergarten. Kate Hardy was described as a charming woman with “magnetic grace” and a “beautifully intellectual face,” and she turned at least one head in Duluth: Luther Mendenhall’s. The trouble with Mr. Mendenhall’s attraction to Miss Hardy was that the prominent pioneer was already married, and Mrs. Mendenhall didn’t appreciate the amount of time her husband spent with Hardy at the school. Ella Mendenhall sued for divorce in 1895. The proceedings—which then involved trial by jury—played out in the local newspapers, with witness after witness telling tales of Mendenhall’s many visits to the private school and how, at social affairs, he had neglected his own wife in favor of Miss Hardy’s company. At a banquet in honor of Proctor Knott, namesake of nearby Proctor, Minnesota, one witness described how Mendenhall “turned his back on his wife” and “talked with Miss Hardy the entire evening.” Hardy Hall handyman Thomas Padget testified he had seen Mendenhall and Hardy in a “compromising position” within the school. Ellen Mendenhall’s attorney, Jed Washburn (another prominent citizen of Hunter’s Park), was accused of witness tampering, and Luther Mendenhall was acquitted with the help of his attorney, W. W. Billson, law partner of Chester Congdon. After the divorce, Hardy was “demoted” to co-principal of the school, and she and Mendenhall began a “proper” courtship. They married in Chicago in 1898 and settled at 1412 East Superior Street. In 1899, as he was dying of cancer, Padget confessed to lying on the stand, saying that he had a weakness for drink and that Washburn and his associates had kept him in cash and liquor throughout the nearly two-month trial. Meanwhile, Miss Laura Jones, a graduate of Chicago University, took over operation of the school, which became associated with her alma mater. She was assisted by Louise Mitchell, who had come to Duluth with Hardy from Eau Claire in 1890. The Duluth school’s name was changed to the Maynard school in an effort to disassociate it from the scandal. It didn’t help. Enrollment was low and during the summer the school advertised lodging rooms for rent. In the summer of 1897, Jones moved the school to the Stowell Building at Superior Street and 26th Avenue East. The Hunter’s Park building was then leased by Reverend John Mason Duncan, a former president of Coates College, who opened it under the name Craggencroft in the fall of 1898. It was originally to be a girls college preparatory school like its predecessors, and Duncan billed it as a school for “the drawing room ladies of tomorrow.” The first year he had just eight students enroll when he opened, but a year later between forty and fifty students enrolled. Duncan could not sustain enrollment, and the school closed in the spring of 1902. It sat vacant for a while as Mendenhall—who still owned the building—considered what to do with it. Some suggested it be turned into a summer hotel for tourists. Pastor John L. Murphy lobbied for it to become a Lutheran Synod, but the plan never came to fruition. The divorce seemed to have cursed any institute that opened within the building’s walls. With no one willing to lease or purchase the building, Mendenhall decided to do away with it. He had the entire structure disassembled, then hired Duluth architects Frederick German and A. Werner Lignell to build three houses on the property at 2000, 2010, and 2020 Woodland Avenue. The original building’s field stones were reused in all three houses, most of them going into the façade of the home at 2000 Woodland Avenue. Today you can still see some similarity between that property and the original school. Luther and Kate (Hardy) Mendenhall moved into the house at 2000 Woodland Avenue and remained there until Luther’s death in 1929 at age ninety-three. The Duluth pioneer, who was a founding trustee of Duluth’s First Methodist Church, ascribed his long life and health to the fact that he was a Quaker and had led a Quaker’s calm and temperate life.